We’d like to take a moment to congratulate our fearless leader, the founder of Minnesota Eye Consultants – Dr. Richard Lindstrom. 2019 marks his 50th year in medicine and 45th year in ophthalmology, a truly remarkable accomplishment. Over the years, Dr. Lindstrom has graciously enhanced the lives of thousands of patients by helping them reach and exceed their visual goals. He’s mentored 100+ fellow physicians and elevated ophthalmology as a whole with his numerous patented innovations and surgical techniques. 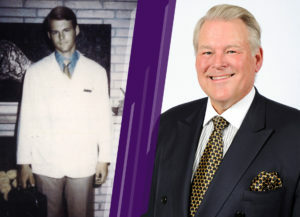 Dr. Lindstrom has been at the forefront of ophthalmology’s evolutionary changes throughout his career, as a recognized researcher, teacher, inventor, writer, lecturer and highly acclaimed physician and surgeon. Dr. Lindstrom has been awarded over 40 patents in ophthalmology and has developed a number of corneal preservation solutions, intraocular lenses and instruments that are used in clinical practices globally. Dr. Lindstrom has presented over 40 named lectures and keynote speeches before professional societies in the US and abroad. He has co-edited seven books, published over 350 peer reviewed journal articles and 60 book chapters. His professional affiliations are extensive. Dr. Lindstrom’s impact on medicine these past 50 years has been unfathomable and to say we’re grateful to have his kindness, knowledge and expertise at MN Eye is the understatement of the year. Congratulations on all of your accomplishments these past five decades, Dr. Lindstrom!